Well here I am again with another problem in our society. Those that know me, know that I love me some Mexican food. Whether it be Taco Bell, a taco truck, or my personal favorite, Thursday night tacos at mom’s house. There have been periods of time where I have eaten some sort of Mexican food at least once a day for weeks at a time. 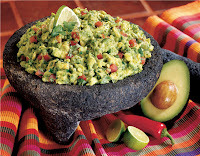 One of the aspects of Mexican cuisine I have come to enjoy is Guacamole. I love the added texture and flavor of the avocado mixed in with everything else. But I must stop at this point and talk about my least favorite food in the world, tomatoes. There is literally nothing I dislike eating more and trust me I have eaten some odd things. It is mostly just fresh tomatoes of any sort. I can handle the cooked varieties. So here in lies my problem…for some reason many guacamole recipes have tomatoes in them. Now I do not claim to be any sort of expert on mexican cuisine but, I mean SERIOUSLY there is no reason for this, 9 times out of 10 there is salsa and/or tomatoes available for those who want the red devil on their palette. The only place I could possible understand it is if you are preparing it purely as a dip for a party and don’t just want a bowl of green stuff on the table. A good friend of mine, and fellow tomato hater, always said the 86% of teenage males don’t like tomatoes. If that is true there is a good chance that a large percentage of them continue to dislike the things into adulthood. So all you aesthetically pleasing guacamole makers out there take a minute and think about what you are ruining for the rest of us.